There are so many advanced and feature rich video play applications throughout the world. But if you are an iPad or iPhone user then you need something to match your style. The article below contains details about top 10 awesome video player applications for Apple devices. This app is available for free with all quality features. Supports drag and drop type transfers. Offers native multi tasking facility. Gesture controls with super easy subtitles are impressive. It is now much easier to watch your favourite video files, music and movies on iPad or iPhone like devices with MC Player. It supports HD video content with breathtaking clarity and one can stream videos directly from internet. MC Player provides impressive synchronization service between audio and video content. It does not require transcoding; everything can be played directly without any conversion. All popular video file formats like M4V, MOV, FLV, 3GP, MPEG, MP4, WMV and GP etc. are compatible with MC Player platform. Wide support to subtitles with instant download facility. Chromecast support added for easy volume controls. Here is an elegant and feature rich platform for your video player needs. It supports all file formats and allows users to enjoy streaming over SMB, UPNP and WI-FI. Appearance of subtitles can be controlled and it also adds password based protection to content library. It offers classic battery performance over wide range of devices. App is also translated to Russian Language. Password protection feature added for safety. Pick KM Player for your device and stay free from all troubles related to conversion, compatibility and safety. It has wide range of features with interactive user platform. It covers almost all popular file formats like WMV, MPEG1/2/4, 3GP, OGM, MKV, DVD, VCD etc. You need not to waste time in conversion process as everything can be easily played on KMPlayer. You will be able to handle 4K content over this video player along with impressive support to 3D and WIDI. It can handle subtitles with ease. KMPlayer is commonly used for popular game streaming. If you are a VLC lover from long past and want to continue with it on your portable devices too then it is good to download VLC for Mobile using internet. This app is compatible with iPod Touch, iPhone and iPad where you can play media files without any conversion related hazard because VLC is compatible with all formats. Easier and simple to use. Can play all media file formats. Can manage your content with well organised libraries. Here is one of the smoothest and simplest player in the list, It extends support to all popular video file formats, you can also play 1080P resolution content without any interference. The impressive 3G playback is a great facility. Developers of this video player have focused upon every minute detail of video clip so you can expect satisfactory results all the time. It offers easy personalization facility. Can handle wide range of file formats. It is well known as a multi functional type video player application that can also handle images, music etc and also works with controller, FTP player, SMB and UPnP. With StreamMode application tool, you can stream your favourite video, music etc to smart TV, Amazon, Apple TV, Chromecast, Roku and many more. It is the most suitable user friendly video playing solution available for iOS lovers. Stream Mode accept all types of media files like TV shows, movies, videos, images and music etc. It assists in fast streaming to other websites using internet. Multiple streams can be managed with ease, one can also get content directly from Cloud. YouTube video casting also supported. AirPlay: as the name indicated, it allows users to stream their videos, photos and music files wirelessly. It also ensures perfect quality of content at receiver end. It’s interface contains wide range of features so it appears little complicated to beginners. Users can create their playlists for music in AirPlay library so that content can be accessed with ease. Professionals find this application highly useful due to its wide range of toolset and features. Easy content sharing feature supported. It comes with latest firmware design. 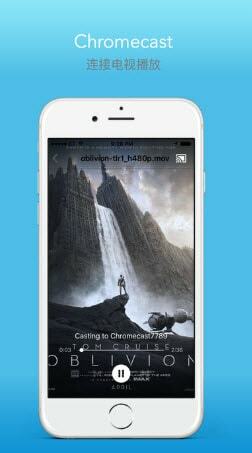 YxPlayer is a potential solution for iPad and iPhone users as it allows video plaback in all file formats. One can also share videos and photos with other members of family using YxPlayer platform. It can work with MPEG-1/2/4, RMVB, FLAC, ALAC, PCM and HTTP etc. Professional’s rate is as a potential video playback solution for iOS users. This tool extends control toward streaming needs as well as support external files.